Yoga and Pilates practitioners alike claim that their programs offer tremendous physical benefits, including weight loss. Weight loss requires you to create a calorie deficit, burning more than you consume. Although most yoga or Pilates classes do not provide a tremendous calorie burn, these seemingly tame exercise regimens do provide weight-loss assistance in rather unexpected ways. These mind-body programs help you better understand your body and appreciate its functioning, which may assist you when you try to lose weight. Pilates is a body-toning program that enhances core strength, muscle control, flexibility and coordination. 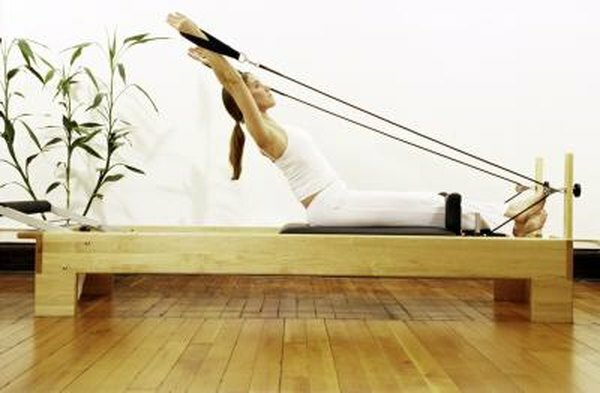 Joseph Pilates created the method in the 1920s, and today Pilates programs are available in fitness centers using just a mat, a contraption called the Reformer or other smaller props, such as balls, rings and resistance bands. According to Marissa Kristal of Fox News, Pilates promotes better respiration, increased circulatory function and a stronger back. The American Council on Exercise says the immediate physical benefits of Pilates are improved posture, leaner muscles and a flatter stomach. Yoga, an ancient physical program with a spiritual component, uses body positions called asanas. A regular practice of asanas helps keep the body flexible, strong and loose. Yoga’s spiritual aspect is grounded in Eastern philosophy and is intended to help you become more mentally present and balanced. Connecting breath, presence of mind, movement and emotions in one practice makes yoga a fitness regimen that continues to gain popularity. Yoga is not one set of exercises--there are multiple interpretations and forms, ranging from “power” practice to a soothing “restorative” practice. Weight loss most likely will not result from a torching of calories in Pilates or yoga--even power yoga burns only 300 to 400 calories in a hour. But these practices inspire a new awareness of your body. Regular yoga correlates with a better consciousness of what you eat, suggests a 2005 study led by researchers at Fred Hutchinson Cancer Research Center. Researchers believe yoga helps people better understand their body’s signals of satiation and prevents overeating from stress. No credible studies support Pilates as a weight-loss technique, but the program helps build muscle, which may help you burn more calories, and an awareness of your physicality, which might encourage you to eat less. Neither yoga or Pilates alone can help you lose weight if don't commit to a reduced-calorie diet and participate in other physical activities. Certain styles of yoga that can provide a higher calorie burn, such as a strong vinyasa flow or Ashtanga class, are not best for beginners. If you're new to yoga, start with beginner classes and work up to these more advanced classes. Pilates can help you build muscle, but be wary of promises from marketers that it alone will help you lose significant weight. Include Pilates and/or yoga as part of your overall exercise and weight-loss regimen. Focus on healthy foods and proper portion sizes, and use the mind-body classes to supplement other aerobic exercise, such as swimming or running. Consider practicing yoga and Pilates on the days you do not do a hard cardio or resistance-training workout; that will help your muscles recover, stretch and feel more relaxed.